I have always loved collecting rocks and shells and bits of stone that look like "something". Dale of Dale Rocks 09 sounds like a kindred spirit. Dale describes himself as a longtime rock hunter but he has only been cutting his own stones for 5 years. You would never know that his lapidary skills are that new. 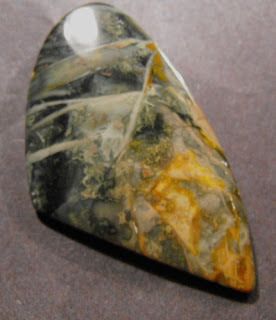 Dales fine lapidary skills are coupled with the eye of an artist to create beautiful cabochons that let the beauty of the stone shine. Dale mines his own Mozarkite and Misouri Lace Agate in the Ozarks. He also cuts other rock when he finds an interesting specimen. I wasn't familiar with Mozarkite until seeing it in Dale's etsy shop. I am now the proud owner of 2 pieces of this attractive highly-colored rock. 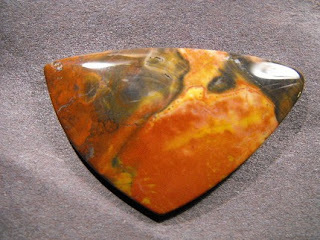 My current favorites in DaleRocks09 are a fabulous free form cabochon of Morrisonite Jasper and a striking jasper cabochon in colors of orange and brown. Gorgeous "rocks" Amazing what can be made from a stone/rock. I agree bev. Stonecutting is an incredible art.